Our rugged and reliable, low maintenance, ecologically sound installations are equally at home in an urban environment or at an isolated site where water and power are not readily available. And with little or no discharge from the waterless toilet system, they can be safely sited close to waterways such as at riverside or lakeside reserves. At some sites they are the only viable option. VIROtech has gained a reputation for installing high quality user friendly amenities which are perfectly suited to the application and provide decades of trouble free service with minimal maintenance and negligible running costs. All installations come with full plans and engineering specifications. Rugged and simple - perfect for your next project. Close consultation with our client regarding expected usage patterns, building configuration, siting and special requirements is key to designing an installation that perfectly suits the intended application. With 30 years experience, we are well equipped offer reliable advice and guidance. Amenity buildings come in any combination of standard and disabled cubicles and can include urinals and storage space. Most buildings include a verandah and disabled access ramp. Compost units are available with capacities of up to 40,000 uses per year (110/day) that can accommodate up to four pedestals. Larger installations may have a combination of compost units to match the expected load and pedestal configuration. 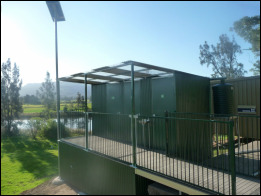 Our vandal resistant buildings are constructed using Duragal (TM) frames, Colorbond (TM) cladding inside and out (unless otherwise specified), hardwood or compressed fibre flooring, and comply with all building codes and standards. Where power is unavailable, a small solar system is installed for the ventilation fan and other items such as pumps or lighting. The solar panel is normally mounted on a mast, well out of the reach of thieves and vandals. A rainwater tank mounted on the building supplies water to a handbasin if reticulated water is unavailable. Maintenance is simple and inexpensive, and with minimal moving parts these units are incredibly reliable. Click HERE to download compost unit specifications, model accreditations, maintenance regime and sample building plans. Client: NSW Roads & Maritime Services.